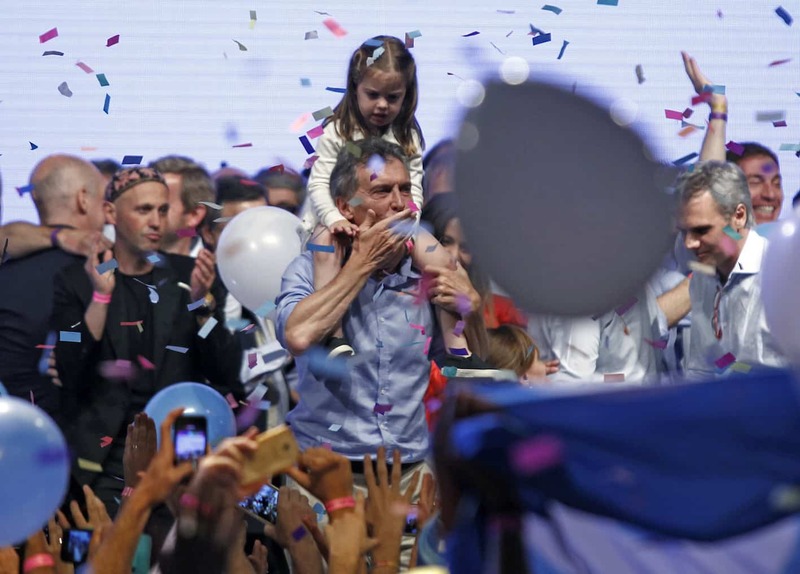 BUENOS AIRES, Argentina — His rivals dismissed him as a spoiled elitist, but ex-football executive Mauricio Macri gathered allies from diverse political forces to persuade Argentines to vote him in as their new president Sunday. With 96 percent of the votes counted at 11 p.m. local time on Sunday, Macri had 51.7 percent of votes compared to 48.3 percent for his opponent Daniel Scioli, according to electoral authorities. With a dashing smile under his piercing blue eyes, the graying 56-year-old channeled discontent among Argentines fed up with the hands-on economic policy of outgoing President Cristina Fernández de Kirchner. In the runoff vote, Macri was the favorite candidate of big businesses and foreign investors alienated by Kirchner’s abrasive approach and protectionist policies. He has proposed easing restrictions on imports and dollar transactions and liberalizing the economy after 12 years of rule by the Peronist movement that has dominated Argentine politics for decades. A social conservative, he opposed the legalization of gay marriages in Argentina in 2010, firmly opposes abortion and once criticized what he called “uncontrolled immigration” in the country under Kirchner. The twice-divorced father of four rose to fame as the president of Argentina’s most popular football club, Boca Juniors. “I wanted to be Boca’s number nine” striker, he once said. Instead, he led in the boardroom during the team’s most successful period, seeing it win 17 titles. The mayor of Buenos Aires since 2007, Macri led a movement called “Let’s Change” aiming to roll back policies that Kirchner says help the working class but business leaders say wrecked economic growth. Macri was born in Tandil, a city in an eastern agricultural region, and previously managed his father’s firm. He is married to model and fashion entrepreneur Juliana Awada — a friend of rival Daniel Scioli’s wife — with whom he has a three-year-old daughter. He has two other children from a previous marriage. Son of a rich businessman and educated at the elite Cardinal Newman College in Buenos Aires, Macri had to tread carefully in a country with a loaded history of class conflict. But he drew leaders of various political stripes to his cause, including Peronists and social democrats as well as right-wingers. In last month’s first-round vote, he surprised pollsters by finishing close behind his opponent, Kirchner’s ally Scioli, and seized the momentum as the vote headed to a runoff. His life has been marked by dramas and scandals. In 1991, he was kidnapped and freed two weeks later after his family paid a $6 million ransom. Macri was cleared of smuggling charges in the 1990s and overcame accusations of links to groups of Boca football hooligans. At colorful campaign rallies, he has released yellow balloons, danced the Argentine “cumbia” and imitated the singer Freddie Mercury, a gay icon. “In the past. he was just right-wing and proud of it,” sociologist Federico González told AFP.